Ethical Food | eating with S.O.L.E. 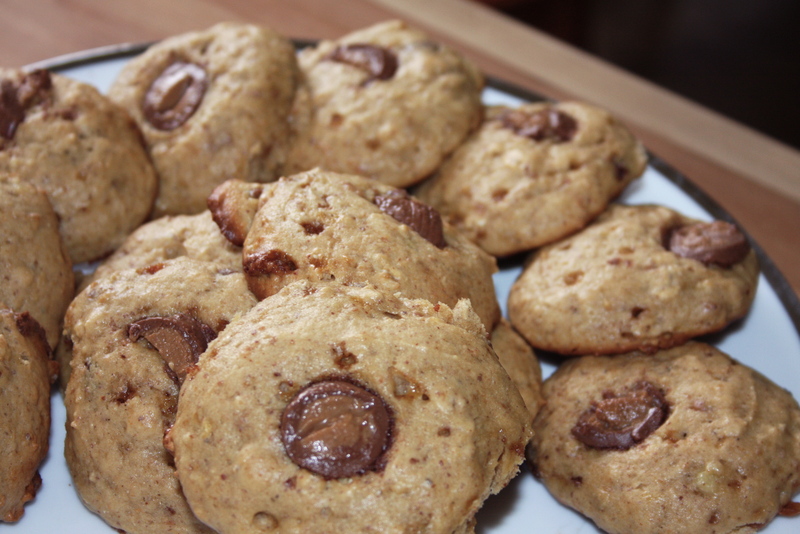 These cookies are like fluffy banana pillows laced with peanut butter, chocolate and oats. They are light and are not too sweet. I had a bag of peanut butter easter eggs in the pantry (which the easter bunny delivered a little early to the discovery of my daughter who knows that shiny packaged candy store treats don’t come home with me often) and some over ripe bananas on the counter, the combo was obvious and the elvis cookie was born! Apparently the king loved PB & banana sandwiches and therefore every time I combines these things I think he deserves some props! I remember back when I was opening my second bakery, testing endlessly vegan banana cookie recipes, none of them really hit the mark. Bananas by nature make for fluffy-cake-y baked goods… so if you like a crunchy flat cookie, this recipe might be more to your liking with an extra 1/2 cup of butter added to make them more flat, and spread-y with a crisp bottom. I however like the occasional muffin top style of cookie, and this one I would make again for sure. Mmmabey even with some nuts thrown in for good measure! Chill dough for 20 minutes then portion and top with a piece of peanut butter cup and bake on baking sheet at 375º 12-15 minutes. My most favorite sister-in-law in the whole wide world spent the last week visiting us, and we celebrated her 30th Birthday early (a couple times), and her birthday treat request was for chocolate brownies! 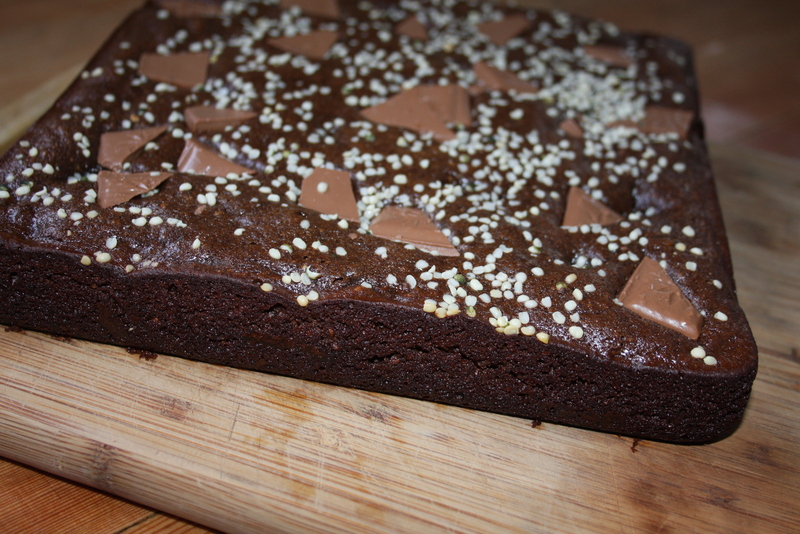 They had brought with them a bottle of scotch so making real butterscotch brownies seemed only natural! This recipe was adapted from the Joy of Cooking Butterscotch Blondies. These brownies were pretty over the top! Filled with huge chocolate chunks, pecans, almonds, hemp seeds, and of course butterscotch sauce to die for. Next time I might just serve the butterscotch with spoons, straight up! I hope you find this recipe as easy and divine as it truly is. Don’t get hung up on the roasting, the sifting, or the 1/2’s and 1/3’s… lots of baking recipes that read as complex are actually just a series of simple steps you can do while your waiting for peaks to stiff, or the oven to come to temp, etc. Also sifting flour is an easy way to get lovely fluffy cakes and muffins. and stopping to scrap your mixer bowl and incorporating ingredient slowly while balancing wet and dry is the best way to get results which will make you happy every time. About 5 years ago I made some roasted banana and nut spring rolls (which I should revisit as they were unreal) It turned out though that I ran out of spring roll wrappers and had a couple cups of roasted banana nut puree left over which I whipped into a banana bread. 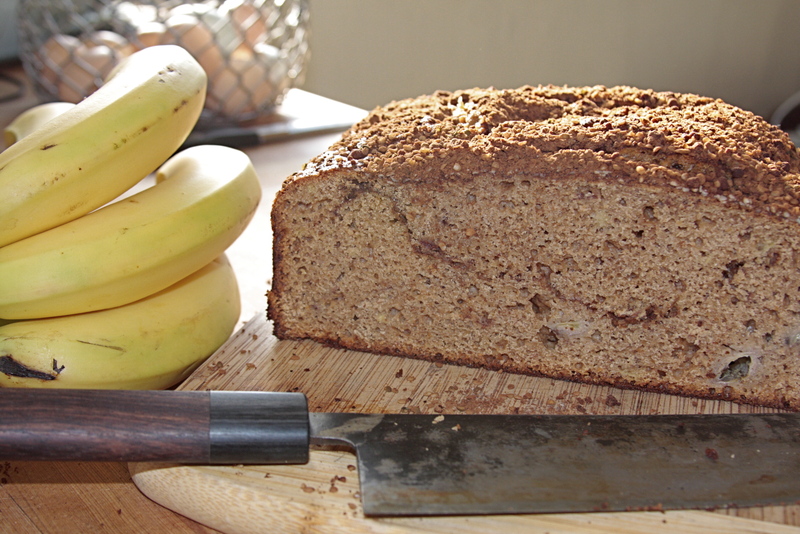 Once I did that, there was no going back for me, I have never made banana bread again without first roasting the bananas. 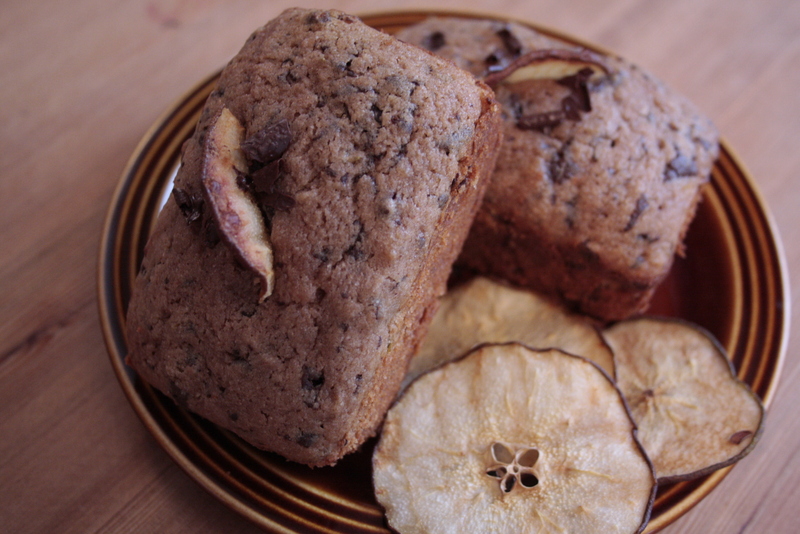 What a delicious way to add a deep complex flavor to a baked goodie! Enough though about all of that, lets talk about this lovely buckwheat cake! This recipe is adapted from a cinnamon streusel coffee cake recipe I love from the Art & Soul of Baking. My variation (as usual) is made with ancient grains and almond butter laced with the caramel wisps of fresh dates and a hint of cocoa. Lots of people think they don’t like dates, but in a loaf like this, the soft flesh of the dates turn magically into little layers of sweet caramel waves. Bring on the date haters… they too will love this! Remove your bananas from oven and add them into your mixer along with 1/3 of the flour mix. Once combined add 1/2 cup of organic yogurt and another 1/3 of your flour, scrap your bowl down and add the final portion of flour along with another 1/2 cup of yogurt. Pour 1/2 of the batter into your hot pan, then sprinkle half of the streusel mix over the top, pour the rest of the batter in and cover with the rest of the streusels mixture. Bake the loaf for 55-60 or a small cake for 40-45 minutes; these would bake off as mini loafs of muffins in 20-25 minutes. A savory and warm split pea soup with smoky cumin and masala spices: vegan, vegetarian, gluten and wheat free. Why is it I always forget how much I adore pea soup until it reaches my mouth? I fall in love all over again every time I taste it. I think I have only made pea soup once before but today was the day for batch number 2. This soup took very little input it just bubbled away most of the afternoon smelling fabulous. Mmm I found an inquiry on chow looking for help with a butterscotch cookie recipe, which really inspired me because the cookie looked just like my great grandmothers gingerbread chew cookie, which everyone loves! Wheat / Gluten Free rich dark deep sugar cookies. 1/4 cup vanilla cane sugar with a pinch of Himalayan sea salt. Start by browning your butter in a small cast iron skillet on medium heat, until golden and nutty smelling. Mix hot butter and sugar in stand mixer for 5 minutes until well combined and gooey and ridiculously yummy smelling. Add eggs one at a time and combine well before then next egg. Scape sides and beat everything for another 2 minutes, along with salt and vanilla. In a separate bowl, sift together buckwheat, bs, and bp. Slowly add flour to wet mixture, scraping down bowl as needed. Mix until everything is well combined then allow dough to cool slightly in fridge for about 10 minutes. Using a mechanical ice cream scoop portion your cookies and drop them into a large bowl with the sugar dredging mix, gently toss dough balls until covered then position on a silpat sheet. Bake at 350º for 10 minutes, or until lightly cracked and golden. This batch yielded 30 x 1 oz cookies. I was thrilled the other day when our friend dropped of some beautiful fresh Dolly Varden fish steaks, from a successful day on the lake. 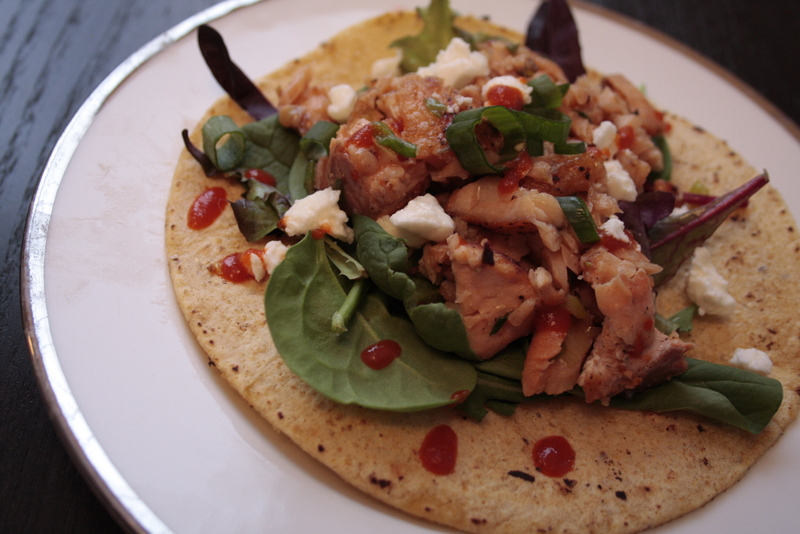 I decided to whip us some fish tacos for dinner last night and I am happy to share the simple steps I took to get these beautiful fish steaks on the table. These tacos aren’t your traditional fish tacos, but they are a really nice spin on the old stand by. I have a small confession to make… I actually HATE cookies. I know you are thinking no one on the planet hates cookies, and I know this is a true fact, because back in my city life I owned two cookie companies, and I did pretty well catering to the cookie cravings of the rest of the planet. Ok so now you’ll understand that after a decade of making millions of cookies I don’t actually eat them, crave them, or enjoy them almost ever. Well this morning something happened… the universe has shifted, because I actually ate 3 of these! 3! This speaks volumes at just how wicked these babies are! 1 cup fair trade dark chocolate chips. Portion cookies and bake on baking parchment at 350º for 12-16 minutes. (depending on how big you make the cookies) I used a 1 oz mechanical ice cream scoop and yielded 30 super stellar cookies! 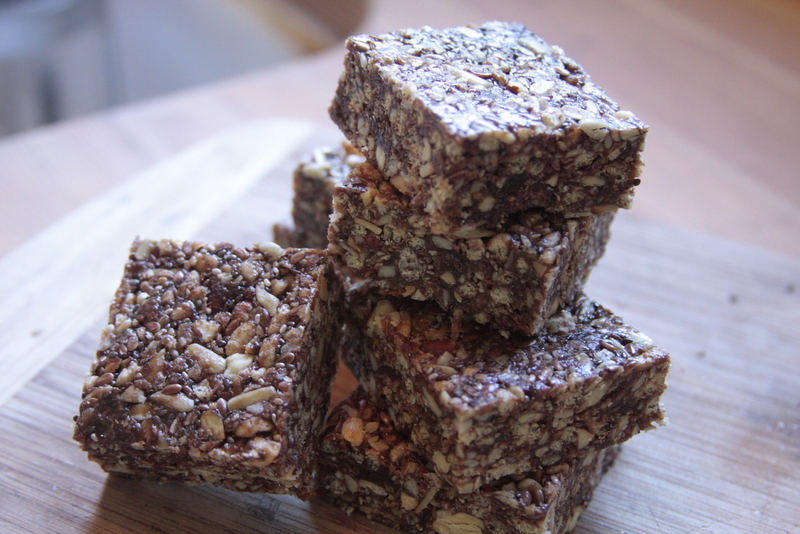 Amazing Vegan Gluten Free Super Power Squares! Packed full of energy and essential fatty acids these are not only the most requested recipe I have, they are a personal favourite! 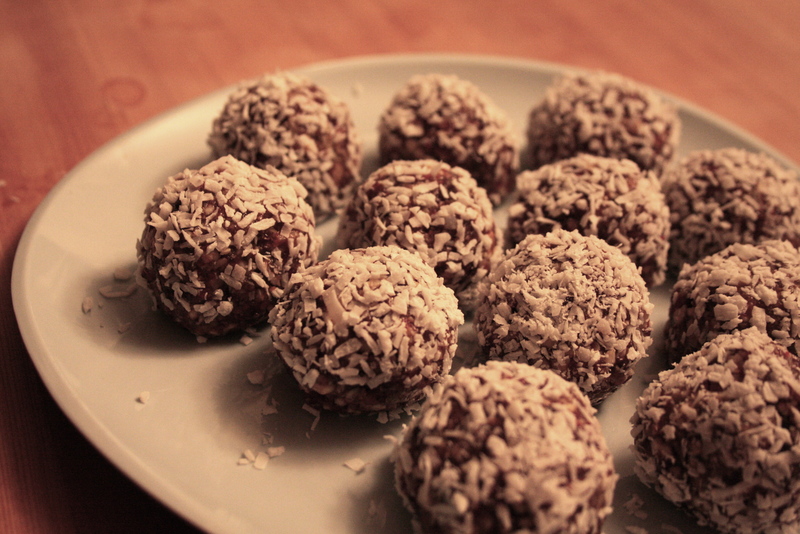 I have made a raw variation of this snack too, which I am happy to share if anyone requests it. Toast cereal and nuts and seeds in oven for about 15 minutes (until aromatic and lightly browned) and then allow to cool for a few minutes before pulsing the mixture in a food processor about 5 (1-second) pulses. Transfer to a medium bowl; set aside. Place dates in the food processor and process until finely chopped and a ball forms, about 15 seconds; set aside. Place almond butter, rice syrup, salt, and vanilla in a medium saucepan over medium-low heat. Stir until mixture is combined and runs like slow-moving lava, about 1 minute. Remove from heat, immediately add dates and cocoa powder, and, using a wooden spoon, stir, smashing down on the dates, until well combined and no streaks of cocoa remain. Pour / spoon hot syrup over cereal mixture and stir, pressing as you do, until evenly combined. (This takes some muscle and time, about 5 minutes.) Transfer to the prepared baking pan and, using your hands, spread and firmly press the mixture into the pan. Let cool completely. Remove the date-seed slab from the pan. Cut it in desired size bars and keep in an air tight container or you can freeze them. * I have a sweet little vintage flower biscuit cast iron pan I often use to form these, in which case I call them chia flower power! That had to grab your attention! These little darlings would be super stellar baked straight up with any old flour, however I wanted to crack open the bag of Organic Buckwheat Flour I got when I visited Annie’s Flour Mill out in Abbostford over Thanksgiving, so I took a pear loaf recipe I scratched down a while ago and tweaked it into this divine little creation. 1/4 cup organic candied ginger finely diced. In a mixer cream butter, sugar until well mixed then add eggs, and fresh or ground ginger. Beat until smooth, scrapping down the bowl as needed. In a bowl sift flours, bp, cocoa add sea salt together. Add 1/2 of flour blend into the mixer, once incorporated add yogurt, followed by the balance of the flour. Now add candied ginger, chocolate chunks and pear, Stop mixing as soon as everything is incorporated. Pour batter into prepared loaf pan and bake at 350º for 60 minutes for 1 large loaf or 25 minutes if you use a mini loaf pan. This is what happens when you dump all the seeds you have in the pantry in to a giant bowl and lace them with chocolate, molasses, coconut and spelt, a cosmic cookie collision of flavour and texture! I make a version of these best selling cookies at the cafe and they have become a valley favourite! Funny too because the gal who originated this recipe now lives in this very valley, as the storey goes… she created the cosmic cookie recipe for Planet Organic, which got published (without her knowledge I hear), the recipe ended up in the hands of a vegan baker friend of mine, who shared a version on her blog, I made it at the cafe, and now make a little different version at home. So here is my homespun cosmic cookie. Mix everything together, portion with a scoop or by hand and bake at 350º for 15-18 minutes. So quick and easy to make the beaming approval and gushing praise will make you feel almost like you cheated! Tags: cookie recipe, dairy free cooking, eating with SOLE, Ethical Food, ethicarian, farm, foodie, local food, organic food, recipes, spelt recipe, sustainable food, vegan baking, vegatarian recipe, vegetarian cooking. 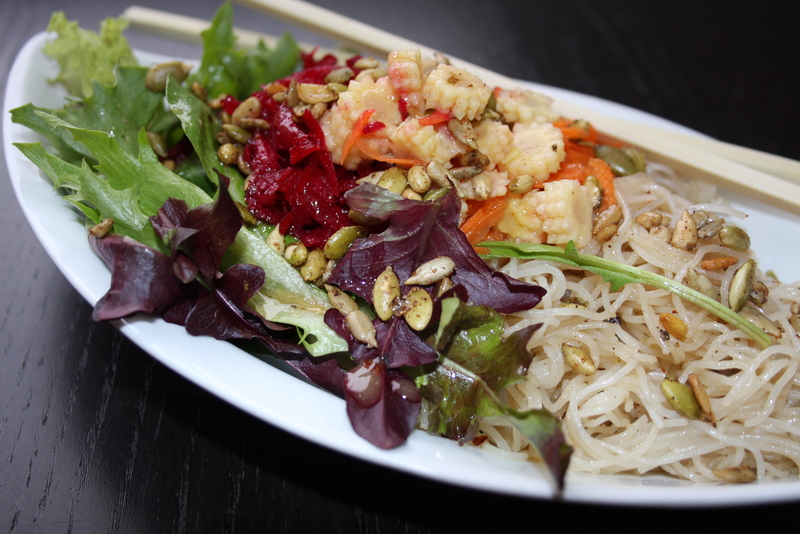 My favorite gluten free noodles are quinoa hands down! They have a great tooth and the best thing about them is they don’t get all soggy, or mushy and overcooked. They don’t turn the water into slime like rice noodles do, they are just more like wheat noodles than any of the many GF noodles I have tried. 2 nights a go I made some quinoa elbow noodles with a simple garlic pesto dressing, they were great but I had a lot of leftovers as we have had visitors this week and I always cook to much when feeding a crowd, so I decided to add the left over noodles to a hearty veggie soup. All day I simmered some carrots, onions, garlic, leek and corn in a rich vegetable broth I had frozen down earlier. I seasoned the stock with dried lemon rind and a little kelp powder, along with some apple cider vinegar and lots of peppery chili’s. After the soup was seasoned perfectly, I added the now room temp left over pesto noodle to the broth and simmered it for 10 minutes before serving. 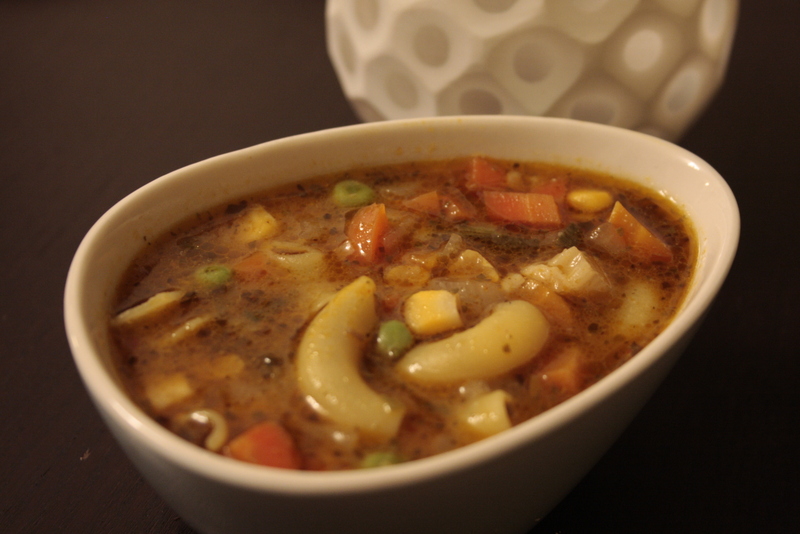 The soup was a huge hit… even in a very un-veggie friendly crowd! 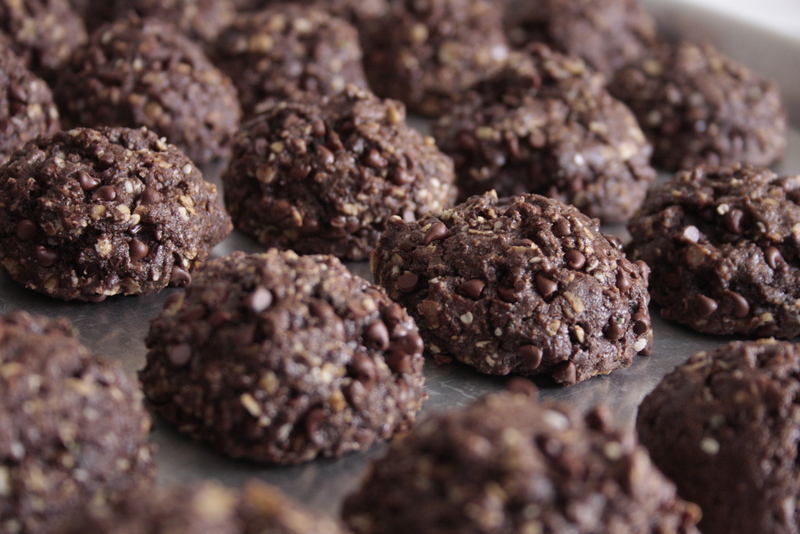 I am baking up a storm right now… more great wheat free dairy free dessert and snack recipes around the corner! 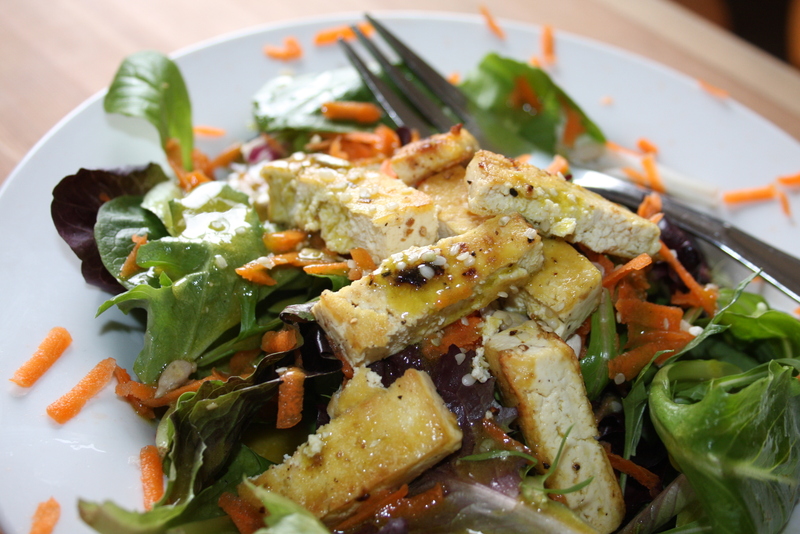 If I had tempeh or tofu I would have grilled it up like this earlier recipe for orange glazed tempeh and added that as well, but this simple lunch is great straight up with any combination of veggies you have kicking around! 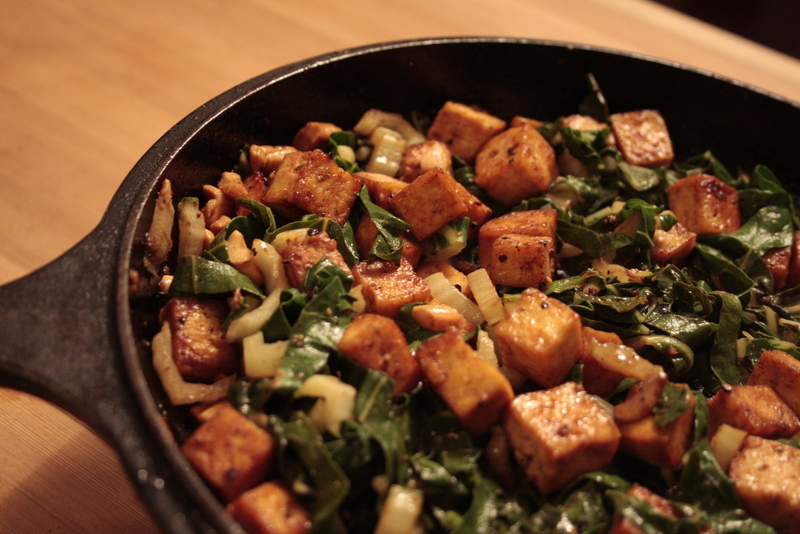 Sticky Ginger Tofu, with Swiss Chard and Cashews: Wheat & Gluten Free, Vegetarian & Vegan. 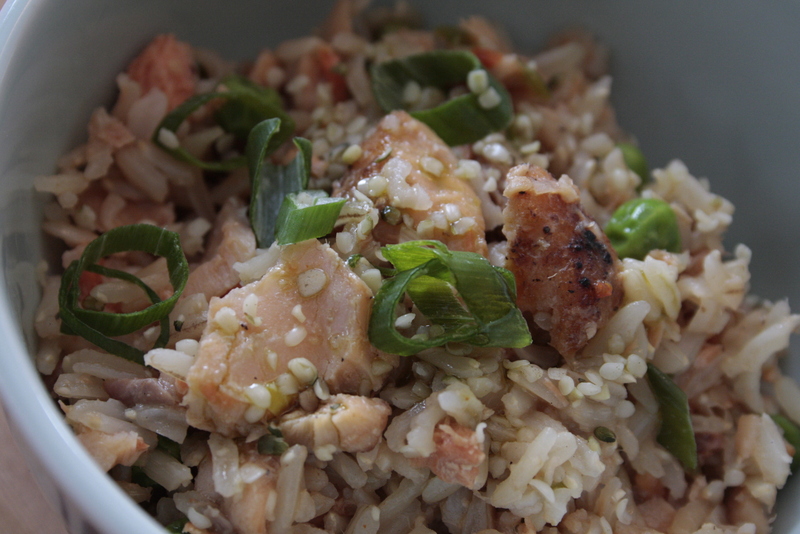 This dish makes a wonderful meal with a nice grain like quinoa or brown rice. It takes only minutes to make and is packed with vitamins and flavor. Also it is some of the only local fresh veggies I can get these days, So i try to cook with Kale and Chard as much as possible. 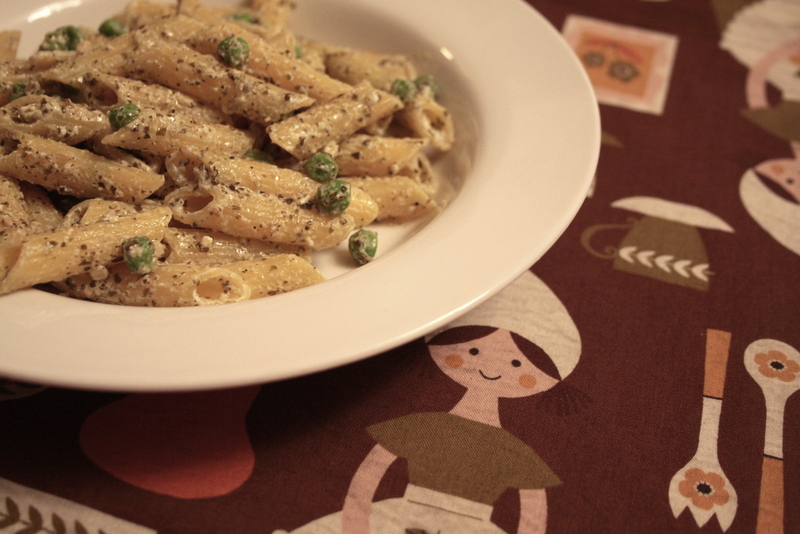 Gluten Free Penne with creamy goat cheese, peas and pesto. Our plates were licked clean all round, poor dog didn’t even get a crack at them! Start by boiling salt water to cook about 2.5 cups of organic corn penne. Once the pasta is cooked drain and quickly add 2/3 cup of frozen peas (from the garden), a dollop of butter (we used goat butter and it is really really nice, it adds just a little of that goat cheesey taste) 2 tbsp of goat cheese, S+P, and 2-3 Tbsp of pesto (I have found a pretty good locally made organic pesto that will cover me while there is no fresh basil to be had… but this summer I vow to make and freeze a whack of pesto’s while the basil and arugula are fresh and abundant) That is it, stir and serve. This delicious dish takes about 16 minutes from start to finish. Enjoy. Our little feathered ladies have kicked into action, and after a week away from Paradise we came home to 4 little brown eggs in the winter coop. I stepped on the first one and stared questioningly at the other 3… “hmm what is that?” I though, in the red warm lamp light of the coop I suspected poop of some creature much larger and then as I noticed I had just cracked something underfoot… the realization of egg production came rushing to mind. Eggs!, they are eggs! WE HAVE EGGS! Eggs! finally after all these months and the last few weeks of guessing when we would get our first egg, and there it was under my furry sorrel boot! This silent snowy winter wonderland that is upon us is really calming and crisp, yet I feel panicky about everything we have yet to do! The coop still isn’t to the state of finish I had hoped, our root cellar never got built, our mud room addition is a work in progress, and my freezer is still full of fruit awaiting jamming. I picked up my old dehydrator on our little trip and am looking forward to using it! Also got a old deep freeze from the grandparents which means we can buy a 1/2 a bison or lamb, locally naturally raised, that is if we don’t fill it with venison hunted right here on our land with our bows. 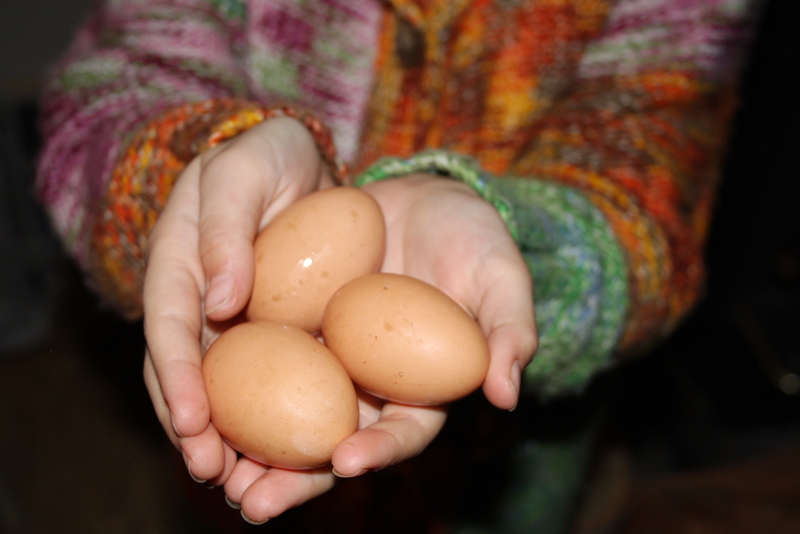 No recipes today, just a happy little post celebrating our egg production system moving forward! Mmm these little carrot loafs are my take on the Rebar Carrot Cake Recipe, and of course carrot cake wouldn’t be complete with out creamy cream-cheese frosting. I confess. It’s true. I am guilty as charged! 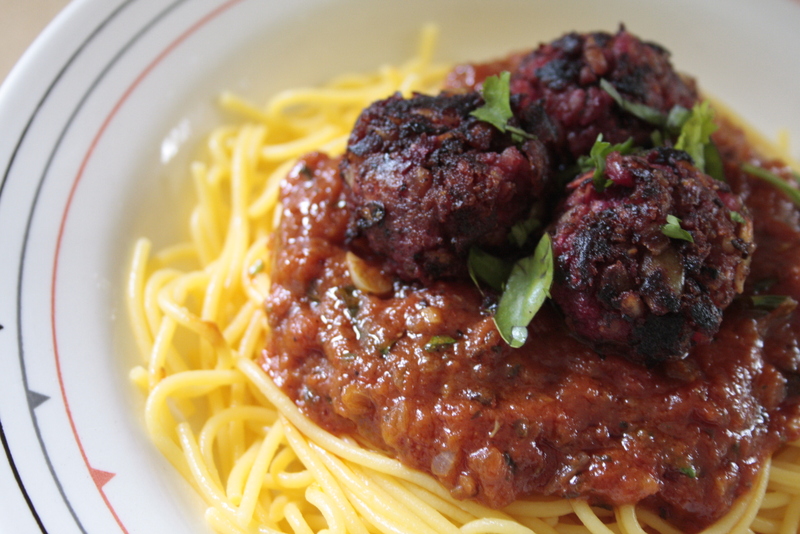 This recipe is neither healthy, nor easy, nor local (per say), nor is it allergen friendly. What it is however is kickin’ and cheesy and wrapped in gooey organic goodness. I found a recipe online somewhere for Apple Walnut Cinnamon roll cupcakes, and I made a version of these at work the other day, and while working with the dough I kinda fell in love with it’s silky elastic-y body. 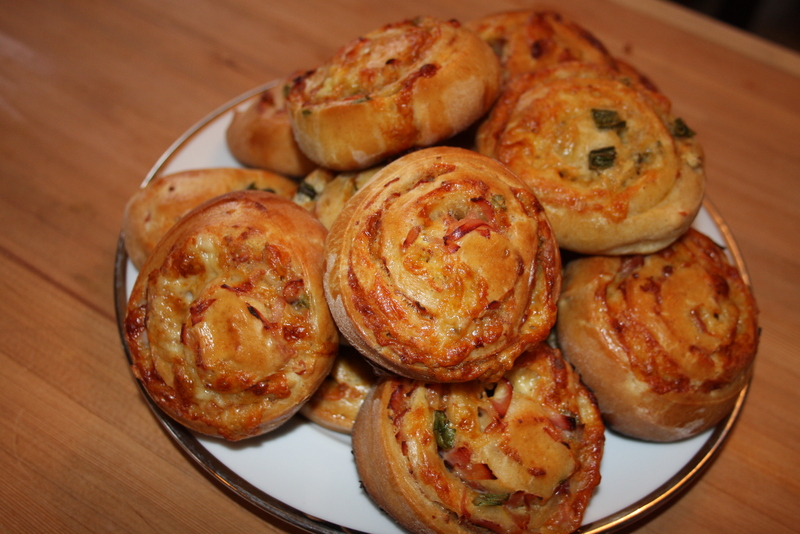 And so in another effort to make interesting lunch treats for my daughter I decided to make a savory take on the sweet buns. This is defiantly more of a Sunday afternoon recipe than an after work ordeal. It takes time and love and a few cups of tea before you get to enjoy the fruits of your labor, but somehow when you get there it’s all worth it. This is a real crowd pleaser, they look like way more effort than they are, and once you make them yourself, I am certain you won’t buy the “asian appetizer sampler” from M&M ever again! Start by browning both sides of firm tofu slices about 1/4” thick you will need three of them, season with S+P and brown in a blend of canola oil and sesame oil, set aside to cool a little. Add to the hot pan: 1 jalenpeno diced, 2 garlic cloves minced, 2” ginger knob finely grated and 1/4 of a red onion finely minced. Get these guys all browning and then add: 3 julienne carrots (sliced finely lengthwise). Reduce heat. You want the carrot to get just tender… not cooked through, about 1-2 minutes only. Add equal parts about 1-2 tbsp each: soy sauce, rice vinegar, sweet chili sauce, and just a splash of sesame oil and coat mixture evenly. Turn off the heat, but leave your pan on the element and add two big handfuls of bean sprouts, 3 green onions diced, and your browned tofu now sliced like the carrots. Mix everything together and place in a bowl. Add a little cilantro chopped and a small handful of fresh spinich finely chopped. Toss everything and set aside to cool completely, then refrigerate until your almost ready to serve the spring rolls. Before using strain the juices from your filling. Well if you have 5 minutes and a food processor you do! This is just a super quickie recipe I wanted to share. It’s Gluten Free / Dairy Free / Raw / Organic and a super yummy power snack, great for the lunch box or a guilt free late night treat. We make a few yummy versions of these at the local cafe I am baking at a couple days a week, and they are always a top seller. Take 1 cup of dried fruit: anything at all, this batch I used equal parts gogi berry, cranberry and raisin, but dates are really yummy, so are apricots! I don;t think apples would work on their own very well but would be nice with something more goopy. Take 2 cups of seeds and nuts; again anything you desire, my last batch I used sunflower seeds, chia seeds, almonds, and cashews. Give these a whirl in the processor along with 1 tsp of cinnamon and a pinch of salt and blend it all until everything is really pebbly then add a good squeeze of honey, agave, or rice syrup (about 2 Tbsp) along with 1 Tbsp of coconut oil. Wiz it a little more and it will start to form a ball in the processor. 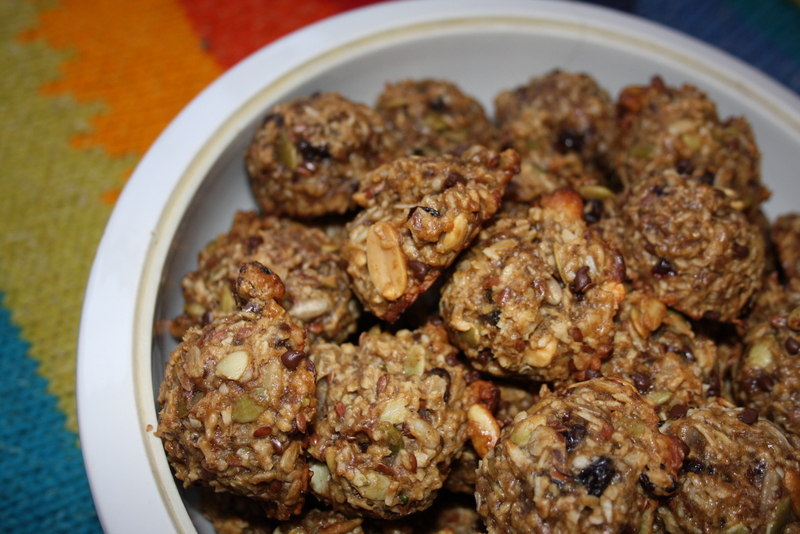 Simply scoop out 1- 2 oz portions and form into balls using your hand or mechanical scoop and roll them in something, I used coconut last night, (which I adore) but I have used hemp seeds before, or ground nuts or flax meal. The great thing about these is you can use what ever you have kicking around, I have even taken a really fruity trail mix and just used that! So no reason not to make these.. you will love them, and once you make them once, you’ll find them so easy and so tasty they will be a regular part of your snack artillery. You will see from the first image in this set that within 2 sq/ft of our lawn alone there are over 7 species of mushrooms (that I can see anyway, I am sure, in fact certain that a mushroom expert would spot double amount) So you will understand with our forest flush with fungal life why we all anticipated our Sunday mushroom study so! Our day started with a classroom lesson on mushrooms and what we are likely to see right here in our own backyard. We touched, smelled and digested a great deal of information. We then went on a mushroom hunting forest expedition and found all sort of crazy fungi. Both deliciously edible and unimaginably strange and beautiful. The one I found the most striking was the oozing strawberry and cream, the red ooze has been used as a die and it is one of the strangest mushrooms I have ever seen. We picked tons of lobster mushrooms, honey mushrooms, a crazy corral fungi, and dug up maybe a dozen the alluring pine mushrooms. Prized in Japan these very masculine mushrooms were my favourite taste of the day as well as the most challenging find. After our forest hunt we had a tailgate mushroom tasting complete with wine and yet more myselium knowledge. We left there having tasted and being able to identify (along with notes pictures and our trusty guide book) a great selection of tasty local options including; Boletes, Lobster Mushrooms, Chantrels, and the pine mushrooms of course. Right after our day of mushrooming we went to visit “our kootenay parents” the namesake and responsibility was given to some amazing family friends by my partners mother, they had us over for a lovely Sunday dinner, where we enjoyed and entire feast of their plentiful garden. We left them with a good collection of mushrooms to enjoy and while we were there I did a lobster mushroom satay in garlic and butter.. mmm! Last night I cleaned and sliced the rest our our pine mushroom haul and prepared a delicious asian marinade of garlic, ginger, braggs, rice wine vinegar, and sesame oil. Tonight I will serve these seared over soba noodles with an asian vinaigrette and some other grilled greens. I am starting to play with more savoury breads as the season change and I am looking forward to sharing more of these recipes with you all as I assemble some winners. Today I am working on pretzels, so I will report on my findings shortly. Last night I threw together a really simple succotash to use up some left over shredded cabbage I couldn’t fit into a crock. We finally ran out of sauerkraut, just as we were all getting so used to having it on top of everything 😦 I am making a HUGE batch of green cabbage kraut as well as a smaller batch using purple cabbage that I will spice up a bit with ginger, garlic and chilli. 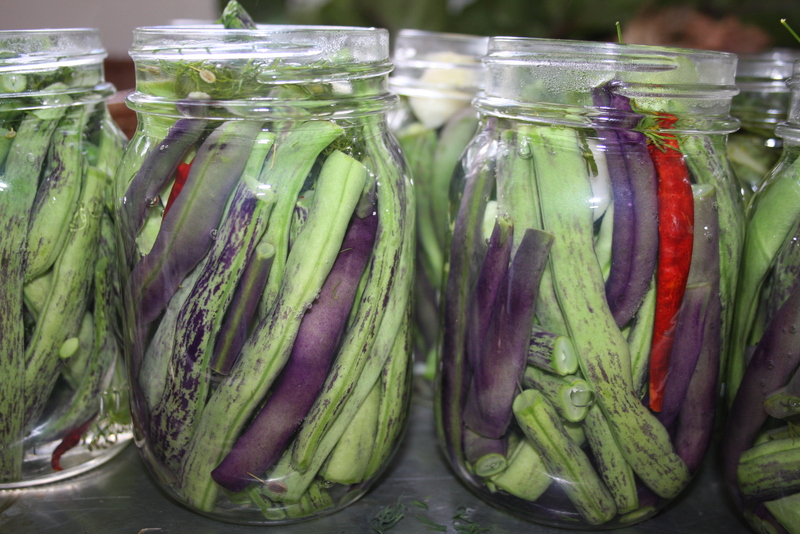 But back to the succotash…. likely I am breaking traditionalist rules by calling our dinner a succotash but as I am not from the South nor have I ever tasted a true succotash, I figure when I fry corn and beans or veggies that pretty much makes for succotash onto itself. So here is what I made, and it was great I served it over brown basmati rice. In a cast iron pan brown 1/2 onion with 2 cloves of garlic and a 1/2 pepper (I used a darling black pepper I grew.. and notably it was the only one that grew) brown these in oil and butter with S+P until just translucent. Add 8 slices of diced cured back bacon (or 6 slices or standard bacon or as the British call it streaky bacon). Let everything brown on medium for about 5-8 minutes. Add 1 cup of cubed summer squash (because no meal around here is complete without some squash snuck in) and kernels from 2 medium ears of corn. To this I added about 1 huge tbsp of a N’awlins spice mix I bought from a gal last year at Christmas Millarville Market. It’s a blend of paprika, peppers thyme salt and likely some garlic and onion granuils too. I think paprika and chili would be a great substitute here. 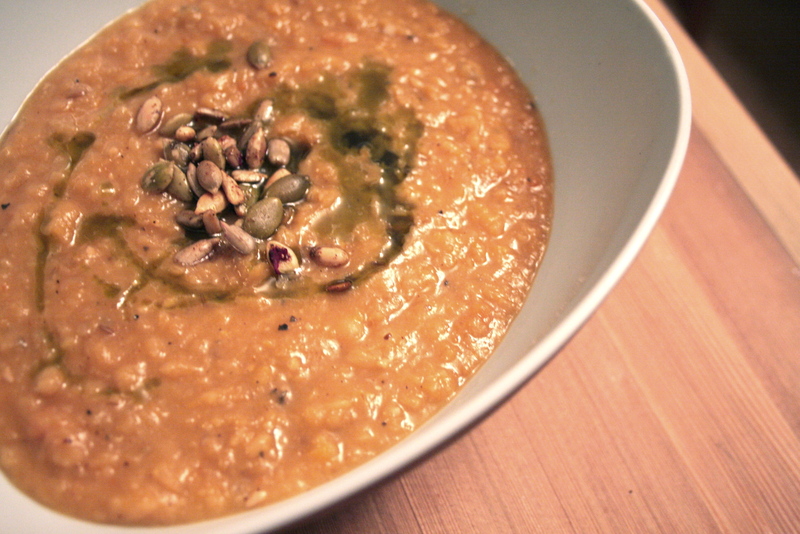 Allow the corn and squash to cook for another 5 minutes along with a dash of red wine vinegar. Finally add 2 cups of shredded cabbage to the top of the pan (don’t mix in yet) reduce heat to low and add S+P to the cabbage, a glug of maple syrup, and a splash of lemon juice. Leave this all for about 10 minutes, or long enough to take the scraps out to the chickens and enjoy the comedy therein, admired new chicken coop in progress, gets plates ready for dinner, toss and serve with a sprinkle of nutritional yeast. Last week I started playing with raw and non baked granola bar type recipes because I want to incorporate more chia seed into my families diet. It is a wonderful super food (you may know as salba) I came up with my own modified recipe inspired from this chow gallery on power bars. The bars were a huge hit and disappeared within hours. 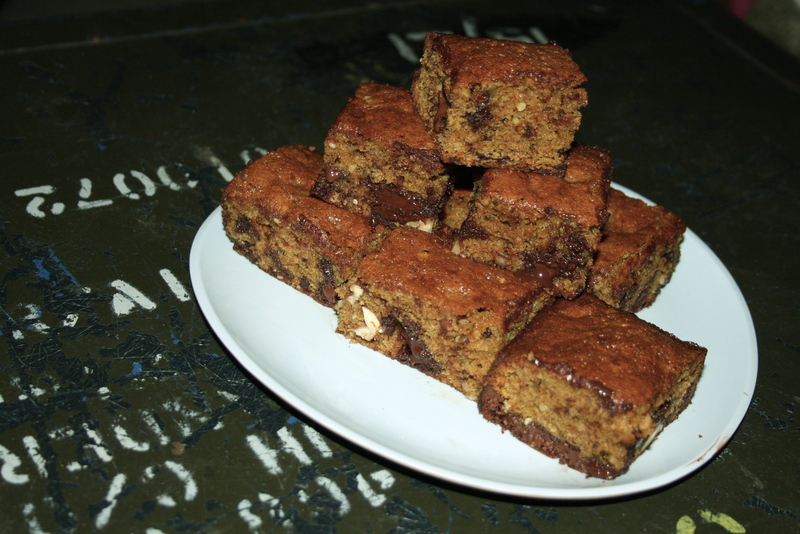 I then made them at the cafe I now bake at 2 days a week and same thing… all gone! 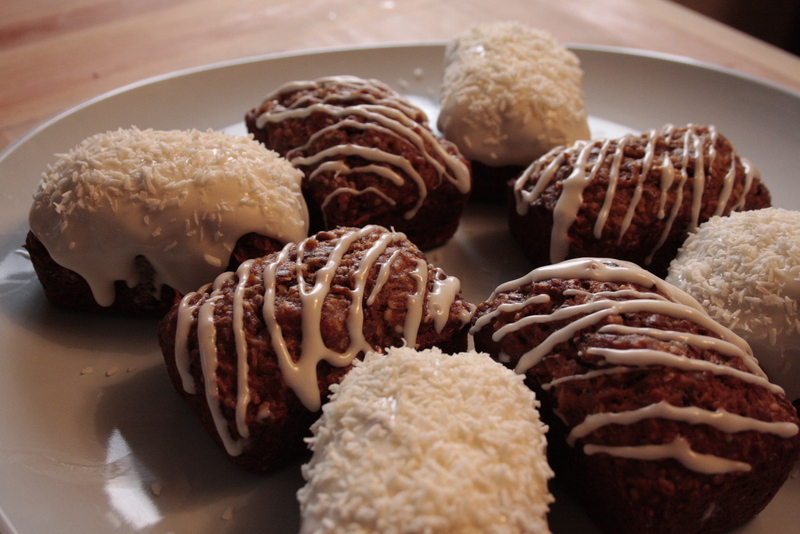 The recipe I made was simply seeds, nut butter, date puree and rice syrup. So satisfying. I’ll whip up another batch today after the pretzels! I started picking concord grapes yesterday under stunning blue skies in the warm 25º sunshine! I don’t have enough yet for jelly so I started a freezer bag which I hope to fill in the next week, and get this jelly making done soon! One more batch of pickled cuc’s and carrots today, this time spicy large jars. We spent the afternoon daubing the waddle for the winter coop, what a simple forgiving grounded form of building! I just love slapping around mud! I will go into more detail about the chicken coop on the building blog later this weekend but today I wondered around the yard and garden in awe of the changes of season…. I am letting everything go to seed to collect later, I am drying beans and peas, waiting on green tomatoes while beginning to enjoy the lovely tomatillo’s . The grape vines are flush and incredible and the chickens are getting HUGE! Thus the need for the second coop and extended run. Tomorrow will be a big day in coop finishing! You’ll see some new pics of our lovely birds, my favorite image is of Red Barron the little black and white bantam, on the coop perch kacadoodle-do-ing… ? We thought he was a gal… but we stand corrected, which sadly means he would make a very little roast and no tiny eggs 😦 Lucky for him we love his personality and he was keep to lean to jump today while Mia and I fed the birds peas if they jumped for them! It was too fun. The other bird picture I love is Elvis (a feather footed black cochin) surrounded by his Ladies: Sid Viscious and Miss Corby, as well as Yoko. Stocked up on more canning supplies today and plan to do another round of pickles and and beets in the next few days as well as grape jelly…soon. While wondering through the garden I picked a little basket of pizza toppings and we used Greek style store bought pita to make individual pizzas the one I especially adored both making and eating had a simple olive oil crust and garlic rub base (no sauce) topped with slice tomitillos (which were bright and almost citrus like), fresh fennel greens, some endive, black olives, hot peppers from the garden too, goat feta and mozza, topped with sea salt and pepper… mmm I then topped the toasted browned pizza pie with a simple salad of greens and endive finely ribboned and tossed with Mia’s garlic lemon dressing. YUMM! 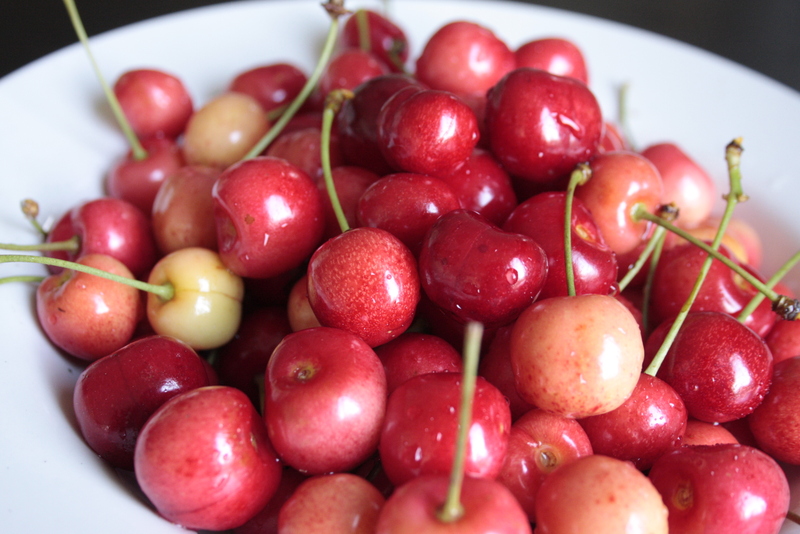 Although we are amid a rainy and cloudy early fall the harvest is very abundant and exciting! This weekend we enjoyed the fall festivities of our thriving community, we took in both the local Valley Fall Fair as well as the Hills Garlic Festival. Seeing the huge and beautiful produce grown right here in my valley on display was a real treat; there were sunflowers over 12 feet tall, there were pumpkins that likely weighted more than me and my daughter put together, we drooled over giant squash, and perfect pears, lovely jellies and baked squares! Most of all we ate and ate and ate. My daughter bravely but thoroughly enjoyed some locally made vanilla garlic gelato, and we all tasted dried garlic slices (for hours in fact we tasted it), pickled garlic and garlic scape (the stock of the garlic plant so I just learned), we also enjoyed wonderful deep dark Ontario maple syrup, local honey, gypsy tea, borsht, and fry bread, to name a few of our indulgences. Our plant expert biology folk friends visited this weekend and we really really enjoyed walking our property with them again as they pointed out some real treasures in the woods, most impressive (for me anyways) was Marks keen eye for the multiple hazelnut tress we have right here! What a wonderful surprise. They are scrappy little tree’s with not much fruit this year… but now that we know they are here, we will given them some attention and look forward to the improved yields to come. We also picked some lobster mushrooms on our walk but after some research decided not to eat them, although we had no trouble identifying them I later learned that lobster mushroom are in fact a parasite to other fungi and are not mushrooms at all, so to safely enjoy these one should be able to clearly identify the original mushroom that has been taken over by the lobster “mushroom” parasite. We are all new to mushrooming so I cast the lovely specimen back into the woods. But our family will be doing a local mushroom walk and lesson in the coming weeks, and who knows one day soon we may be dining on mushrooms of all sorts! Another exciting week of food adventures to report! This week I am playing with lactic acid fermentation, I know it sounds scary but it is super exciting! Also I am flush with squash and zuc’s from the garden… thus the final inspiration to get me fermenting: spicy kimchi here I come! I have a huge jar of kombucha on the go right now, which Dylan’s mom started for me last weekend with one of her mother mushrooms. Talk about a daunting entrance to the world of fermenting. I have a massive Costco size pickle jar on my shelf full of pink fluid with what looks like a piece of pig skin floating in it; kinda like a science lab jar with a baby something in formaldehyde! Fortunately our family has experienced the benefits of kombucha already; both Dylan’s grandparents, his mom, and him have all reported an easing of stomach ailments upon using commercially purchased kombucha in a jar, and thanks to Helens efforts to buck the system we are now brewing our own! So let me take this all back a step and get you thinking about more commonly used fermented foods: yogurt, sauerkraut, kosher pickles, & Korean kimchi… not too scary right? Well all of these are made using a super simple, old world method of preserving foods which doesn’t require heat, which in turn doesn’t diminish the health benefits of the food being stored, and in fact in most cases the natural bacteria within the process are extremely beneficial, does PRO BIOTICS ring a bell? So not too long ago the universe seemed to be hitting me over the head with the idea of fermenting foods; A truly talented and inspiring chef from back home and fellow Permie Valerie Andrews, did a demo of sauerkraut making simply using salt and water for our PDC class in Nelson, this happened only weeks after meeting with yet another Permie who was racing home to Vancouver Island and his bucket of fermenting cabbage, I then read an earlier mentioned book “Independance Days”, where the author raved to no end about her adventures in kimchi making, right around this time Helen got her first starter kombucha mushroom, and now that I am diving deeply into any and all methods of putting up food that don’t require heat other than the sun for drying (namely because I still don’t have a stove top), my current drowning in squash situation was really the straw that broke the camels back, enough encouragement for me to get on the fermenting band wagon. I am thrilled to share my adventures thus far!